Today I am thinking about how we tend to make God in our own image. This photo shows how religious people sometimes portray an image of an angry God to the world.. even to children. Now I understand that the bible and the gospel is more than just these three sentences spoken by Jesus so many years ago. Yet I believe that they help to condense my thinking down to the idea that God loves us so we should in return love Him and love the ones that he loves. In a sense these sentences solidify for me the image of God in my mind as a loving Father who has created children in His image with the ability to simply return His love to Him and to others. 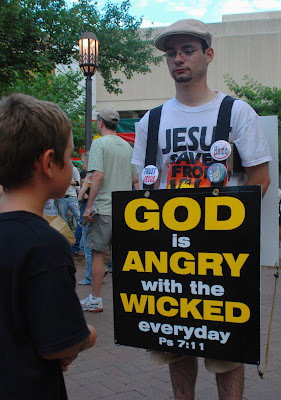 Angry God: I think that this is the deity that many people, like my friend Brian, were taught in their childhood. In some strange theistic dichotomy God is presented as one who loves you so much that you need to be afraid of him.. especially if you "sin". Hell, sin and the wrath of God are front and center when this image is presented. Holy God: This image is a bit different than the previous one. God is still sometimes presented as angry but more of an "angry at sin" rather than "angry at you". The issue here is still the preoccupation with sin and judgment. Exclusive God: This image is found in different forms in the religious world. Some theologies ascribe to the idea that God created some to be exclusively predestined to heaven and some to hell and torment. Some believe that if you are not one of us then your destiny is one filled with fire and brimstone. In these scenarios both God and His followers are exclusive entities. Enabling God: This is the image that basically says that God is too nice to allow anyone to suffer.. of course this thinking always adds "after they die".. obviously most people are allowed to suffer before they die. This view presents God as a weak Father who in the end will do anything to ensure that His children do not suffer. The view of man in this scenario is one of the saddest. I have opined a bit on this previously in a post titled Divine Pets. Absent God: This image is the closest thing to atheism or agnosticism that I can think of. It is the idea that God once created the world then took off into the vast regions of the universe and is no where to be found. Don't pray to this entity because He won't answer and is not interested in us. The Man Upstairs: If ever there was a God made in our image it is this one. Basically this view says that God is one of us.. He thinks like us.. He judges like us.. His view of fairness is similar to mine.. or yours. This is the image that placates folks who rarely think about God and live lives devoid of anything spiritual. Santa Clause God: This is the image embraced by many narcissistic leaning folks who believe that God exists to answer their prayers and to lavish them with good things. This thinking believes strongly in the promises of God when it is to their benefit to do so. I once wrote about this phenomenon with regard to healing here. Well I think that I have covered enough to make someone mad at me. Of course these ideas are faulted.. like me they are not perfect.. these images are, in a sense, the images that I have about those images. I have a hard time understanding the cross in terms of a loving God. The penal substitution model seems to make the cross make the most "sense" (and in a legal way, not in a God loves you buthas to send you to hell if are a sinner way). My husband and I teach Sunday school to 3/4 graders at our church and I got a brief "glimpse" of something today. Christ is the END of the sacrificial system and God himself provided it for US....maybe not for Him and His wrathful vengeance purposes.. I can't put my finger on it, but there is something there.